Click here for information, new expansions, and thank-yous for the new (less expensive!) Rucksack Edition of Fantastiqa. Fantastiqa is that game with "a Q instead of a C at the end" favorably mentioned by Rich Sommer of Mad Men on BBC America's The Nerdist. Thanks, Rich! "It's a beautifully surreal adventure and likely will be played many, many times in the future." "I really like the combination of the mechanics with the theme. Original, dreamlike. "Did I like it? Silly question! This game is charming and nasty in equal measures! Five well deserved magical gems for this supremely enjoyable game! " will see it for what it is.... this game is based on simple concepts and rules that eventually become an extremely complex game. This quality alone raises it above the rest!" in about a year and a half!" From Gryphon Games, publisher of my earlier game The Road to Canterbury. 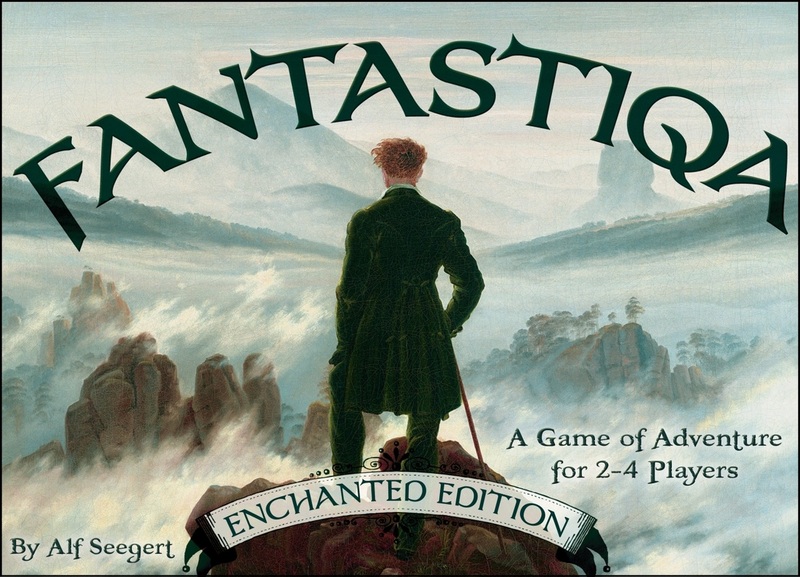 Fantastiqa is a deck-building board game set in a fantastical landscape of dark forests, mist-shrouded highlands, and frozen wastes. As you and your foes journey around the board, you will subdue strange creatures and fulfill fabulous quests. FANTASTIQA is a love song to everything I adore about fantastic landscapes and Euro-style game mechanics. It combines deck-building with a game board in unique ways to create a very fun and replayable 60-75 minute gaming experience. For 2-4 players, ages 8 and up. For a very helpful combined gameplay demo and review see CritsHappen. Assorted reviews are here... see the Dice Tower review, G*M*S Magazine's brand-new review, Troll in the Corner's in-depth review here, Jonathan Liu's review in GeekDad/WIRED Magazine, and Richard Ham's gameplay walkthrough. Read my Designer Diary. I'm quite proud of it, actually. I recently wrote an article for "Why I Design Games" which goes into some detail about Fantastiqa. Here is a direct link for purchasing all things FANTASTIQA, including all available expansions, at the Eagle and Gryphon Games website. If you want to be updated about the status of Fantastiqa, please fill out the form below. Thank you!